Gooner's Diary: Ramsey Inspired Renaissance? If ever we needed a reminder of quite what a fickle mistress football can be and the gossamer thin divide between unbridled ecstasy and abject despair, we Gooners have enjoyed a stark demonstration, in both encounters this past week, of the confidence boosting benefits afforded to the club that’s graced with Lady Luck’s capricious favours. Considering quite how often we’ve fallen victim to the inspirational goalkeeping efforts of David De Gea in recent seasons, it felt as if we were long overdue a slice of good fortune against Man U. Still there’s no escaping the fact that if it wasn’t for Man Utd’s profligacy in front of goal last Sunday, we might’ve witnessed an entirely different turn of events. Aside from being deprived of the immense satisfaction of an all too rare clean sheet (which was almost as gratifying as the victory itself! ), we might’ve been denied this incredibly euphoric cherry, on top of a costly point-dropping cake of a weekend for the competition. I happened to be sitting in Club Level on Thursday night. Reverse snob that I am, in the past I invariably used to decline any offers to sit in the prawn circle, where one gets dirty looks for disturbing the peace & quiet, preferring to sit in my own lower tier pitch, able to give full vent to my vocal exhortations without feeling too conspicuous. However nowadays I’m extremely grateful for the occasional Club Level invite because it’s so much less exhausting for me to be able to remain seated for the entire 90-minutes, rather than being up and down like a Jack-Rabbit all game long. Worse still, in my own Block 18 seat (a block away from the visiting fans), I’m forced to spend the entire game trying to anticipate when those in front of me are about to stand up, whenever the ball comes down our end of the pitch. Otherwise, it’s become such a struggle for my creaking bones that by the time I struggle up out of my seat, I’m all too often in danger of missing whatever it is that everyone else is standing up to see! Many of those who were sitting with me in Club Level on Thursday night might not fully appreciate quite how close the Gunners came to making an embarrassing Europa Cup exit because so many of them were still availing themselves of the free halftime refreshments and had not returned to their seats in time to see Niang’s effort hit the woodwork in the opening moments of the second-half. Presumably the Gunners would’ve produced a somewhat more focused second-half performance, if Rennes had bagged a precious away goal at that stage of the contest. But if Mustafi & co. had gifted the opposition this encouragement, it might well have made for a far more uncomfortable evening against the French side and their vociferous fans. We certainly would’ve been far less forgiving and wouldn’t have been able to laugh off Aubameyamg’s glaring misses quite so flippantly. After the stick PEA took following his feeble penalty against Spurs, his willingness to step up again, against De Gea, spoke volumes about our Gabonese striker’s character. The cream of the crop in most competitive sporting endeavours tend to be shameless egomaniacs because it invariably takes a supremely self-centred, obsessive belief in one’s own ability to rise above mediocrity. With Auba having revealed prior to the match that he’d be unveiling a new alter-ego in the event of him scoring against Rennes, I was peering through my binoculars prior to kick-off, to see if I could spot a bulge in his socks or his shorts, which might indicate the presence of a mask. When nothing materialised during the celebrations, after Auba scored in the opening minutes of the Gunners early barrage, I wondered if he’d decided against it. Or could it have been the case that he hadn’t accounted for the possibility of us losing the coin toss and being forced to swap ends at the start? Perhaps Pierre thought it best to leave any such tomfoolery until after the Gunners had done the business and got their noses in front in this two-legged tie. But it tells you everything about our shy, retiring striker that he was sufficiently confident of notching another goal to go to the trouble of placing a bag behind the advertising hoardings at the Clock End containing his new mask. Truth be told, if Rennes had put the tie on a knife edge and threatened our progress into the quarterfinals by nicking an away goal, after Auba had subsequently missed a couple of sitters, we’d have wanted his head on a plate for pratting around, instead of fully focusing on the task at hand and PEA could’ve headed off to “Wakanda Forever” for all we cared. But surprisingly we managed to maintain a second successive clean sheet and our very own Black Panther was only left to rue the yellow card, brandished by a by the book, spoilsport Latvian ref who obviously didn’t appreciate Auba’s antics. 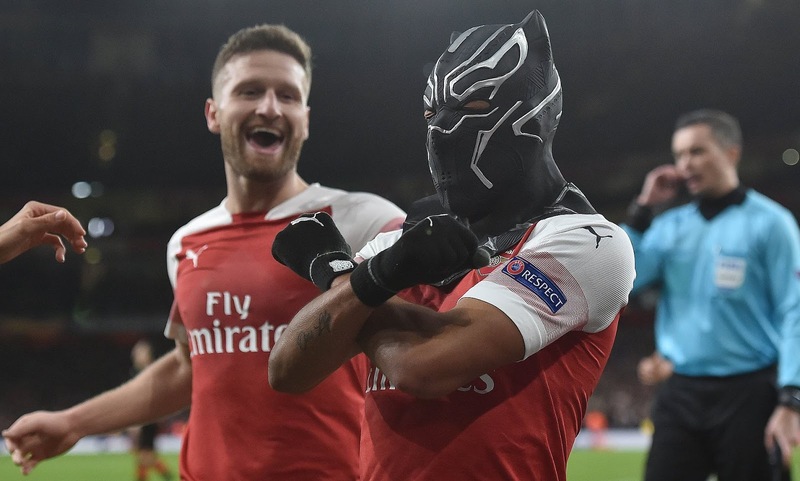 Doubtless there will be plenty of killjoys who’ll criticise Aubameyang, but with this mask stunt being something that he started at Dortmund, I quite like the idea that the timing of his new superhero disguise attests to Auba’a burgeoning self-belief at the Arsenal and only helps to foster a mood amongst the rest of our squad of a team that is currently enjoying their time on the pitch. Yet we mustn’t get carried away, after all if it wasn’t for the fortuitously timed reduction in Lacazette’s suspension from three matches to two, Unai would’ve been deprived of the option of playing the pair of them and the Gunners might not have been able to produce the scintillating intensity of that opening spell, which cancelled out the opposition’s advantage within a mere 15 minutes of the kick-off. 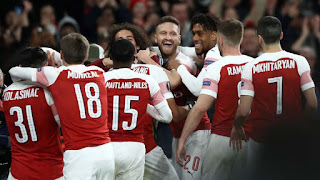 Additionally, there’s more than a little irony involved in the fact that we’ve spent most of this campaign to date focusing on the contribution of Torreira and Guendouzi as the primary evidence that the new regime have begun to ring the changes and the soaring mood of positivity resulting from the two victories this past week has been achieved in the absence of our two principal arrivistes. Instead of which, I’m sure some might agree that it’s been the dynamism of Aaron Ramsey, providing forward momentum in the middle of the park, which has proved to be the most obvious difference in both games. Emery seems to be developing the knack of motivating his troops to produce the sort of intensity necessary to steam into opponents and put them under the cosh right from the off. Yet it remains to be seen if he can continue to inspire this sort of urgency on a more regular basis, so we might achieve the sort of consistency necessary to secure a top four finish. I’ll wait to see if we can reproduce this same fervour against Newcastle and Everton, but even as one of Granit Xhaka’s greatest critics, I have to admit that he’s barely put a foot wrong in both matches and his form appears to benefit from playing alongside Ramsey. Hopefully we can count on Torreira benefiting from his time on the sidelines, so that he might return to the starting XI at some stage, reinvigorated and transformed back into the whirlwind of a Tasmanian Devil that we witnessed earlier in the season. And while Aaron might be a sufficiently experienced old-hand not to be guilty of overplaying on the edge of his own box and risking being caught in possession, in the manner that we’ve seen on the odd occasion from an immature Matteo, I’ve no doubt that Guendouzi will get his opportunity in the home straight to reprise his influential role to date. Nevertheless, if the Gunners were to achieve the mammoth feat of a winning streak between now and the end of the season, this would make Ramsey’s departure even more difficult to swallow if he continues to play such a significant role. Meanwhile with Ainsley Maitland-Niles creating our first goal, scoring the second and demonstrating a “shall not pass” resolve in defending our right flank on Thursday night, he definitely deserved “man of the match” consideration. I was wondering if Ainsley felt he had a point to prove, after being left out of the England U21 squad, but as was the case against Man Utd, he suddenly seems to have grown into his Arsenal shirt. In his rare run outs at full-back in the past, I’ve found myself criticising AMN for too often thinking he can use his searing pace to get him out of trouble, whereas in both appearances last week he seems to have acquired he discipline to ensure he’s goalside of the ball, facing up his opponent, instead of chasing back alongside him to try and effect a last-ditch tackle. 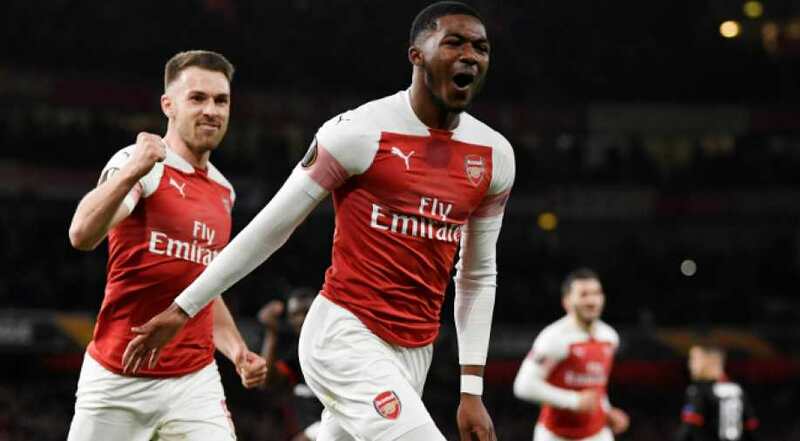 If Ainsley continues to progress at such an impressive rate, Hector will have some job on his hands displacing him when he returns to fitness and hopefully some serious competition for his right-back berth will only benefit Bellerin (as opposed to Hector knowing he can walk straight back into the first XI the minute he returns from his ACL injury). 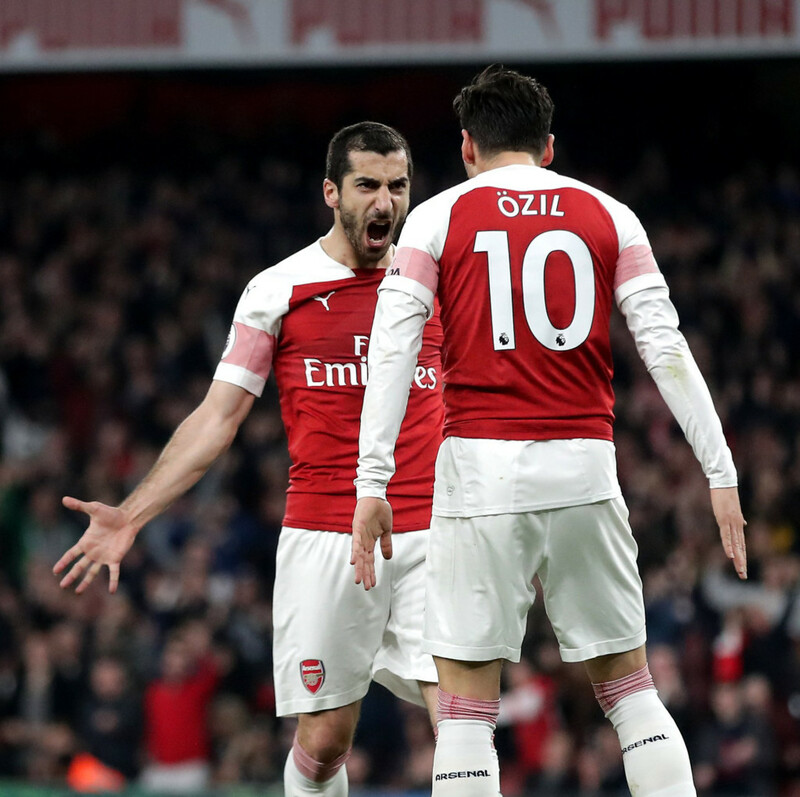 Although these two triumphs and the two clean sheets definitely did not demonstrate that Unai’s leaky ship has suddenly become watertight and that he’s discovered a solution to the defensive deficiencies which have plagued us all season. But while we still might be prone to being exposed at the back, there appears to be increasingly satisfying evidence of a renewed determination to prevent any such inadequacies costing us quite so dear. There’s little that pisses me off more than the sight of anyone in red & white turning their back, in a cowardly fashion, to avoid being hurt by a powerfully struck shot. By contrast, there’s little that pleases me more than the sight of one of our players courageously throwing themselves at the ball, with absolutely no thought to their own personal safety, in an effort to block an attempt on goal with some part of their body. As a defender myself in my dim and distant youth, such brave incidents of self-sacrifice for the Arsenal’s cause are almost as pleasurable as the paroxysm of joy when the ball hits the back of the net at the opposite end of the pitch. In an age when one can’t help but cynically question the commitment of our modern-day mercenaries, where loyalty is measured in terms of the obscene number of digits in their pay-packets, it’s inevitable that we question whether their desire can possibly live up to to the unstinting devotion of those of us on the terraces. Thus it’s positively heart-warming to see the Gunners make like bona fide troopers, willing to risk life and limb for the multi-millionaires beside them. Unlike a 30-yard screamer into the top corner, this sort of defensive valour attests to the burgeoning of a genuine team spirit, amongst a group of players who might just be beginning to buy into “project Unai”, as they discover quite how much more they’re capable of achieving, when they respond to the unrelenting, wild-eyed haranguing from their somewhat batty Basque gaffer. Yet one, or even two swallows do not make a summer and when one considers that it was only a couple of weeks back that we were ten points behind Spurs, with the majority of Gooners already having begun to question Emery’s capacity to take this team forward, I certainly don’t want to tempt fate by going overboard. We need remember that this is the same Unai Emery who’s left Mesut Özil spending much of the season earning his eye-watering £350k per week by shining the bench with his backside. So long as Unai persists with putting our most talented players out on the park and energised by their warm weather break in the Emirates (in Dubai, as it’s unlikely to be eighty degrees in N5! ), we go on to produce an equally vigorous performance against the Toon, while the game at Anfield the day before goes to form - speak it quietly since a lot can happen during the fortnight of this International break – our noisy neighbours might well end up being the April Fools, with the natural order of things restored just in time for the grand opening of their new white elephant. Albeit there’s still some serious snagging to be accomplished at Spurs new stadium, if the video clips of the water pouring down inside the building were genuine (don't forget to pack an anorak)! It’s going to be a helluva long couple of weeks with no domestic footie, at such a crucial stage of the competition, when we Gooners have been left positively salivating for more ever since last Thursday. Still at least we’ve plenty of time to see if there exists such a thing as anti-stab boxer shorts for our impending trip to the welcoming environs of Naples. Lastly (phew!) watching all the other matches this weekend, it seems as if almost every club now has a green kit and I have to wonder as to the IQs of these marketing geniuses responsible for putting teams out in a green kit, on a green pitch. Did it not occur to any of them that footballers are far less likely to perceive their teammates around them, when they're blending into the background! If I never see the Gunners play in green again, it will be too soon! Tottenham Hotspur We're Coming For You!